Back in high school, I would always cook breakfast for my family if I ever was the first to wake up. From scrambled eggs, home fries, or scallion pancakes, breakfast on the weekends was always something special. We hardly had the time to eat breakfast during the weekdays – a quick fried egg or piece of toast while going out the door was the norm, so being able to all get together first thing in the morning was fun. I loved having the whole kitchen to myself and then calling everyone down to the dining table. My family loves pancakes, but it’s not always easy to get a pancake that comes out fluffy but won’t deflate on you after sitting on the plate for a minute or two. 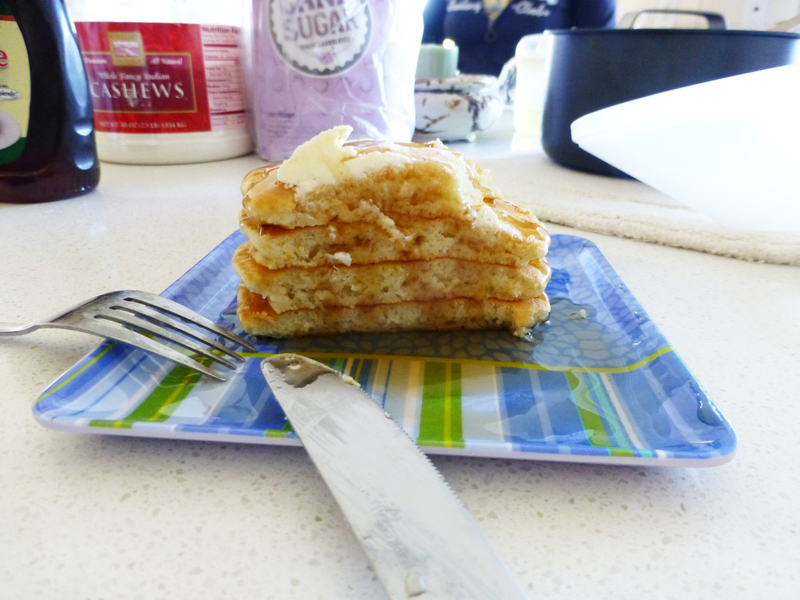 I’ve also had my fair share of deformed pancakes due to my lack-luster flipping abilities. 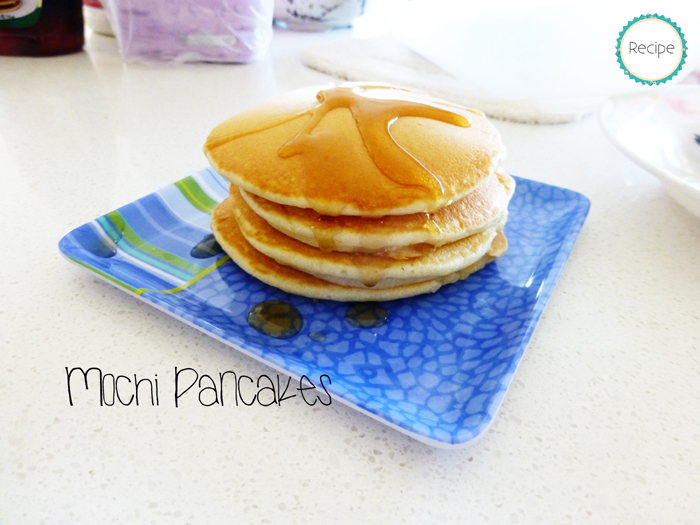 I found this recipe for mochi pancakes while I was going through my mochiko phase back in high school. 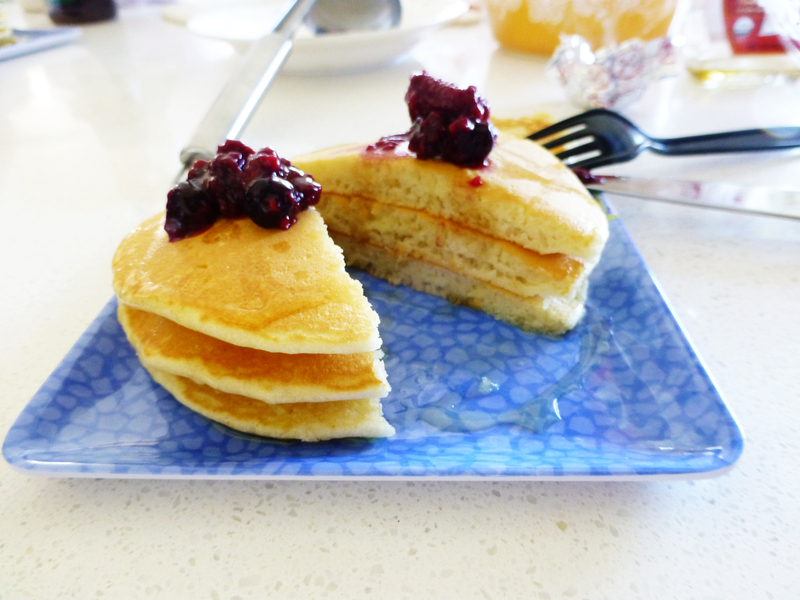 The pancakes turn out soft yet dense and thus are quite filling. I’ve made several variations of these pancakes using orange zest, lemon zest, and cinnamon, but plain old vanilla seems to be the favorite in my home. My favorite part of making pancakes is when you’re down to the last of your batter, but there’s not enough to make two same-sized pancakes. Therefore, I just pour the rest of the batter into the pan and make one giant pancake. It’s also interesting seeing how everyone in my family dresses their pancakes differently. My dad slathers on the butter and drenches his pancakes with multiple types of syrup – he’s still deciding if they even taste different at all. My mother likes to dollop on one of her homemade fruit compotes and then adds a touch of agave syrup. My sister is a traditionalist and prefers to only have maple syrup on hers. Personally, I like to spread on a little bit of unsalted butter on my pancakes and then drizzle a bit of maple syrup. Stir the milk mixture into the flour mixture until just combined. Preheat a griddle or large skillet to medium heat. Put about a third of the beaten egg whites on top of the batter. Gently fold the egg whites into the batter. (Slice down through the center of the mixtures with a rubber spatula, then pull the spatula up along the side of the bowl and over the top, gently incorporating the beaten egg whites with the batter. Rotate the bowl a quarter turn and repeat the process until the egg whites have been incorporated.) Add the rest of the egg whites and gently fold them in until no white streaks remain, taking care not to deflate the batter too much. Use the batter right away. Using a measuring cup or ladle, pour about 1/4 cup of the batter onto the heated griddle/skillet. Repeat, spacing the pancakes at least 1 inch apart. 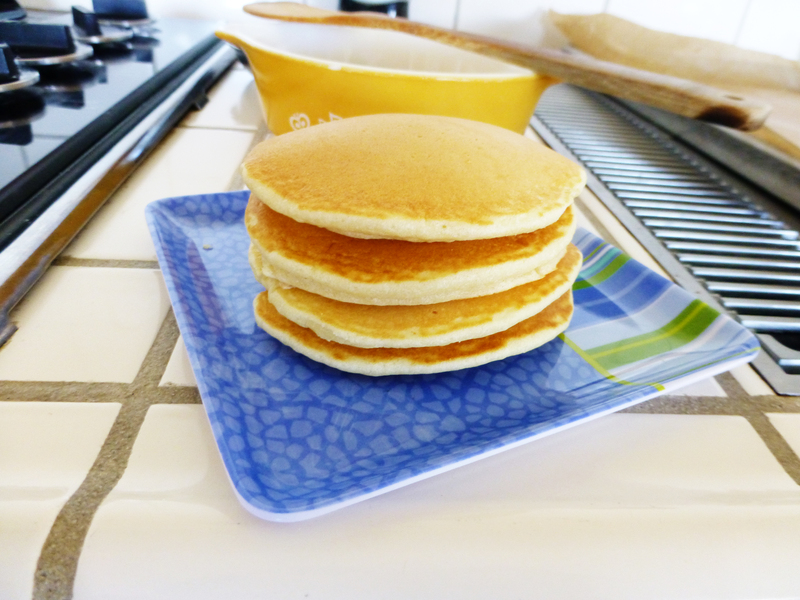 Cook for 1 minute, or until bubbles in the batter start to pop and remain open on the surface of the pancakes. Carefully flip the pancakes and cook the other side 30 seconds to 1 minute. Repeat with the remaining batter. Serve warm with desired toppings. Thank you for sharing your recipe. I will try it next. For syrups, try mixing just a little maple syrup with jams/preserves or jellies then microwave it about 30 seconds or till you get a thick syrup.